Clear end caps look great on El Wire! Just place them on the end of the el wire and use a heat gun to secure them in place. 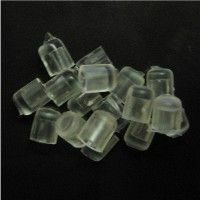 Our clear plastic End caps ensure that the end of your wire is protected and safe. To attach, just push the end cap onto the end of the wire. Clear plastic End caps for 2.2mm and 2.6mm EL wire only.